If you can scrounge up three bucks and the courage to order a fish nugget in mixed company, I can introduce you to the tastiest two-bite morsel in town. Technically, the good folks behind Kinship, which sits in the rotunda at the base of 1603 Orrington, refer to their delightful nibble as a “chicken- fried scallop shooter,” a nod to the elemental pleasures of tipping back shot glasses filled with slippery oysters or liquid shrimp cocktails. 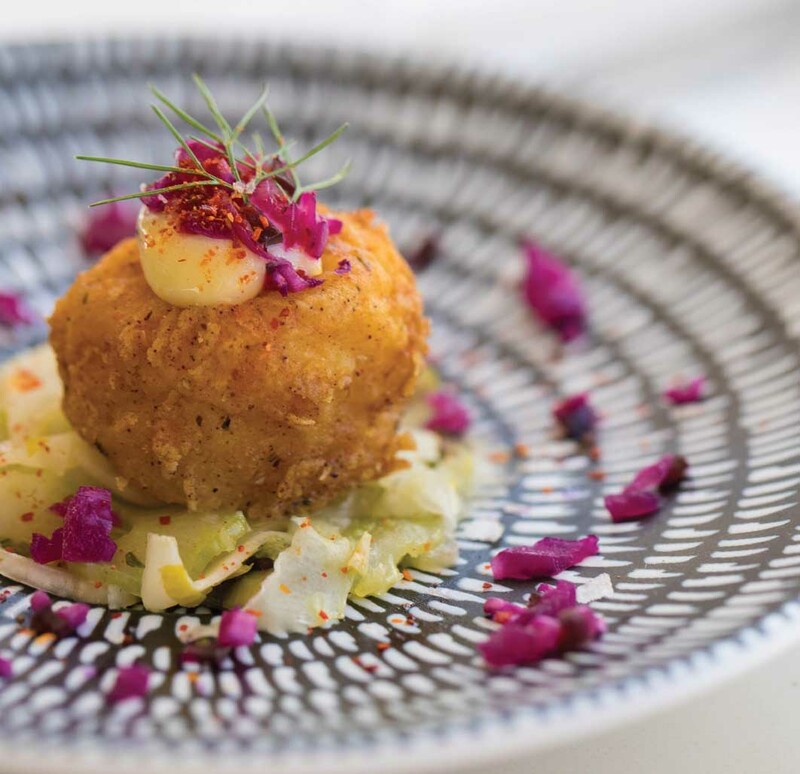 rrives at your table—nestled atop raw fennel and below a swirl of lemon aioli dappled with cumin, cabbage slaw and a salsa fresca—it’s a showstopper. And to my surprise it delivered with a bang. Crunchy yet delicate. Meaty and briny with cold hints of licorice from the fennel. And a creamy acidic punch from the aioli and cabbage. Why rhapsodize, one might wonder, over a tiny snack? Because that little scallop exemplifies precisely how Kinship hopes to carefully walk the tightrope between approachability and sophistication. First and foremost, owners Carey Cooper and Gail Taggert realize that looks matter. Gone is the carrot-meets-rutabaga color scheme that characterized the space’s former tenant, Lyfe Kitchen. In its place walls are sheathed in deep midnight blues, maroon banquets curl around the room and cozy camel-hued leather line a welcoming bar. Imagine the mise-en-scène from Edward Hopper’s “Nighthawks” re-imagined for the modern age and you’ll get the sense of what’s to come. Instead of trying to hide the restaurant’s crescent- moon shaped floor plan, Cooper and Taggert have embraced it. There are so many different geometric patterns here—empty picture frames, blocky wire-framed fixtures and gorgeous circular wall sconces that beam halos of light against the wall—you almost expect someone might to slip you a trigonometry test before the wine list comes around. Oh, but it’s dazzling inside. All this soft light shines down and refracts off the round carrera marble tables and the dark gray flooring until the shadows and light swirl and dance through the room like a cup of coffee getting filled with fresh cream. Kinship’s inaugural menu seeks to find a similar balance between simple American classics (roasted chicken, filet mignon, lobster bisque) and more robust staples from around the globe (spicy Thai curry bowls, Moroccan lamb burgers, lobster cavatelli). There’s little doubt that Vernon Hills-born chef Marco Bahena’s travels—stops in France, Spain, Nantucket and at Everest in downtown Chicago— informed the menu. Some of his presentations are canvass-worthy, especially his tuna tataki. Thick slices of raw tuna topped with bits of watermelon radish and edamame, are fanned around a central well of ginger-lime marinade as if it were an edible flower in bloom. And even something as simple as a mixed green salad with hearth-roasted chicken and tahini- miso dressing is brightened by thick curls of orange and pink carrots that wind through greens like silky ribbons. 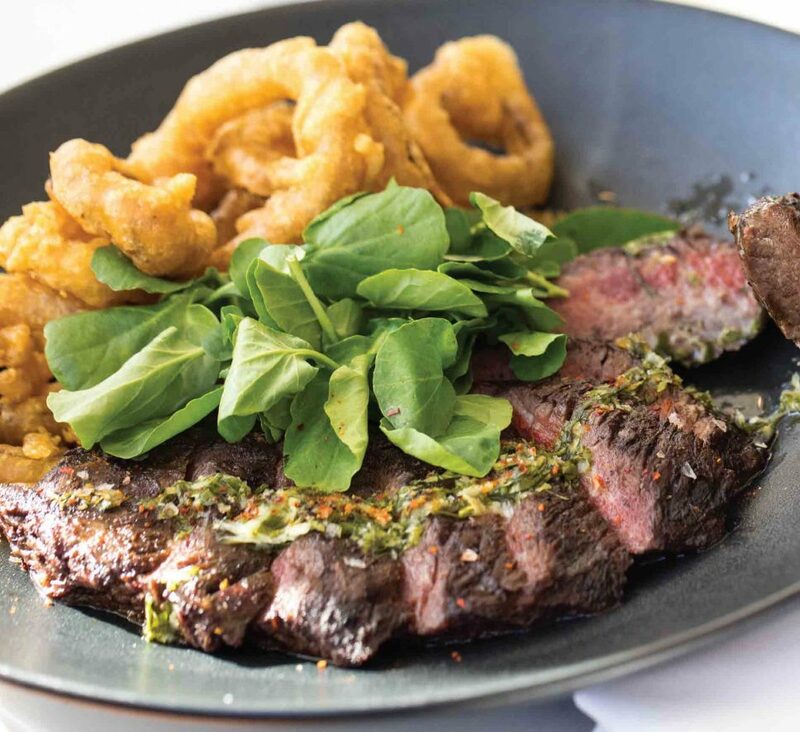 Tried and true entrees deliver the best value, especially an inexpensive hanger steak fired in the house’s Woodstone oven. The beef gets topped with a horseradish gremolata that swaps out parsley in favor of arugula to highlight the slightly spicy green’s subtle undercurrent of black pepper. You can’t go wrong with the house’s simple salmon either, which is glazed in a miso-mirin sauce that’s not cloyingly sweet and bolstered by pickled kumquats and crunchy kale flakes. Just make sure you save room for dessert, which aims to ensure eclairs return to their former glory. Kinship’s éclair tasting—you choose three out of five revolving options—is a must, especially if you order my personal favorite: Kinship’s lemon-meringues which is whipped up with an inspired spoonful of tart yogurt. Add an order of apple strudel, which is topped with a neutralizing creme fraiche, and you’ll be sugared up enough to become a North Shore “Nighthawk” in your own right. Kinship, (847) 563-8242, is located at 625 Davis Street, Evanston. Its website is www.kinship.restaurant.